Honed aggregate is technically another type of exposed aggregate with some distinctive differences. The same materials used to make exposed aggregate make honed aggregate. 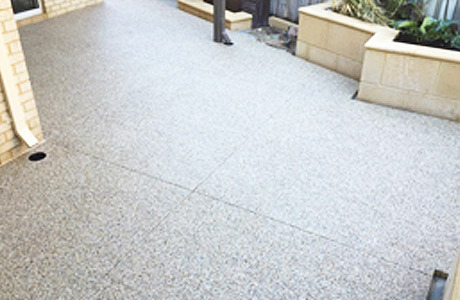 Since the materials are the same, if you opt for this type of surface, you will have the same variety of stones and vast numbers of colour choices as you would have with exposed aggregate. The detail that sets honed aggregate apart from exposed aggregate is the fact that honed aggregate is ground down, giving the material a much smoother finish than exposed aggregate. This smooth finish tends to add a modern flair to the areas where it is used and makes your surfaces “ouch-less”, a great feature if you have children running around your home. Where is Honed Aggregate Suitable? Another detail about honed concrete is that we are often able to hone your existing exposed aggregate. Honing exposed aggregate already in place is a great way for you to save money, while updating the look of your home or business. The benefits of honed aggregate far outweigh the negative aspects of this type of decorative concrete.